The New Year is now well underway and in Camden our new housing allocations policy has gone live. Camden has seen a huge rise in rough sleeping in the borough as the number on the streets tops 600 for the first time in five years. The high cost of housing and cuts to services have been blamed for a 17 per cent hike in rough sleeping in Camden last year, echoing something from a Dickens’ novel according to one expert. Ian Bangay, of Camden Council’s Safer Streets team, said: “The word Dickensian is very apt. It’s a huge rise and I do find it shocking. “People spoke some years ago about reducing rough sleeping in London to zero and yet look at it. 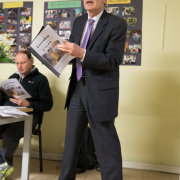 Ian Bangay, project manager of the Camden Safer Streets Team, described the rise in rough sleeping as ‘Dickensian’. Our investigation has revealed that almost three quarters of those living on Camden’s streets have mental health problems or are addicted to drugs or alcohol. Just before Christmas the Ham&High went on patrol in Hampstead with those tasked with tackling rough sleeping. Among those we found was one homeless man hidden inside a dirty duvet, just metres from the multi-million pound mansions around Whitestone Pond. 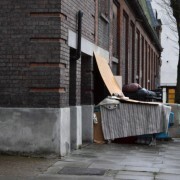 Those working to reduce homelessness say there has been no increase in London-wide resources yet the number of rough sleepers in Camden has jumped from 361 in 2011 to 601 last year. This is placing a huge strain on services. The number of rough sleepers is being fuelled by hundreds who are new to the streets, we can reveal. Just over half of the 601 people sleeping rough in the borough last year were UK nationals and many are not previously known to agencies tasked with tackling homelessness. “The majority of the people that we’re seeing are new to the streets and will never have been seen before and that’s shocking,” said Mr Ian Bangay, project manager of the Safer Streets team, which provides outreach services to street sleepers. The number of rough sleepers in Camden has leapt by 66 per cent since 2011, from 361 people that year to 601 in 2015. 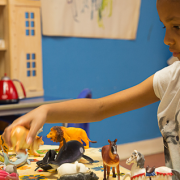 Among the factors influencing the rise are high house prices, cuts to services such as day centres and homeless people arriving at St Pancras, King’s Cross and Euston stations and staying in Camden. “Things get closed down and you don’t think it will have an impact, like day centres for autistic people for instance,” said Mr Bangay. “When the government take populist measures such as cuts to benefits, people think they’re saving UK money but they don’t think about the consequences to the homeless population. “If they cut housing benefits there’s the cost of having 600 people on the streets – not just to police, the health service, the council, but the cost to human misery as well. The availability of highly addictive legal highs in Camden Town has also contributed to the rise, he said. Three quarters of those on the borough’s streets last year had identified mental health, drugs or alcohol issues and far more men than women slept rough, 525 males compared to 76 females. The Safer Streets team sends outreach workers to try and help rough sleepers into shelters and to access support. But the number of places in shelters has remained static while the number of rough sleepers has increased sharply. Camden Council said it is doing all it can to tackle the issues. Spring 2015 -Celebrating 25 Years!!! http://www.doorsteplondon.com/wp-content/uploads/2016/01/IMG_6576-1.png 686 457 [email protected] /wp-content/uploads/2016/03/logo-6.png [email protected]2016-01-05 10:58:572016-03-15 09:04:58Spring 2015 -Celebrating 25 Years!!! © Copyright - Doorstep London 2018| Registered Charity No. 1007692.